Sport Court’s engineers work to design high-performance courts that increase the safety of the athletes playing on them. In fact, through independent Lab Testing, our products have been shown to reduce the likelihood of a head injury from impact and to reduce the shock on joints. Making it the safest surface for both young and old. Click HERE to find out why we're "safest court in the world"
PowerGame Suspended Surface reduces the likelihood of a head injury from impact according to testing based on the Head Injury Criterion (HIC), a nationally standardized test. On a concrete surface, the likelihood of head injury can occur from a fall at less than 1.0". 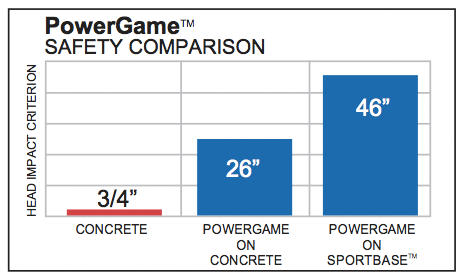 PowerGame Suspended Surface placed on top of concrete helps reduce the likelihood of head injury by increasing the distance to 26.0". When PowerGame is placed on top of SportBase the distance is increased to 46.0". TESTING SUMMARY: The research team at The Orthopedic Specialty Hospital (TOSH) Sport Science tested Sport's PowerGame product to explore how humans attenuate of dampen shock during landing. GOAL: The goal of this project was to explore the effect that playing surfaces have on the loads experienced by the body. *TOSH-The Orthopedic Specialty Hospital is one of the country's premier facilities for orthopedic surgical care, rehabilitation and physical therapy, sports performance training, and nutrition counseling.